One of the many inspirational phrases people love to say is, “live life with no regrets”. But do people really live up to that ideal? What about that time you got a perm? Or when you ran a red light? Or when you dated that horrible person? As far as dating and love go, I believe I have lived my life (so far) with no regrets. I have had my fair share of heartbreak. It seems I’ve been through the lowest of emotional lows because of some of my past relationships. But never once have I regretted one of them, no matter how bad I got hurt, because ultimately, some good memories came from those relationships. When they ended, I learned something about love and about myself. 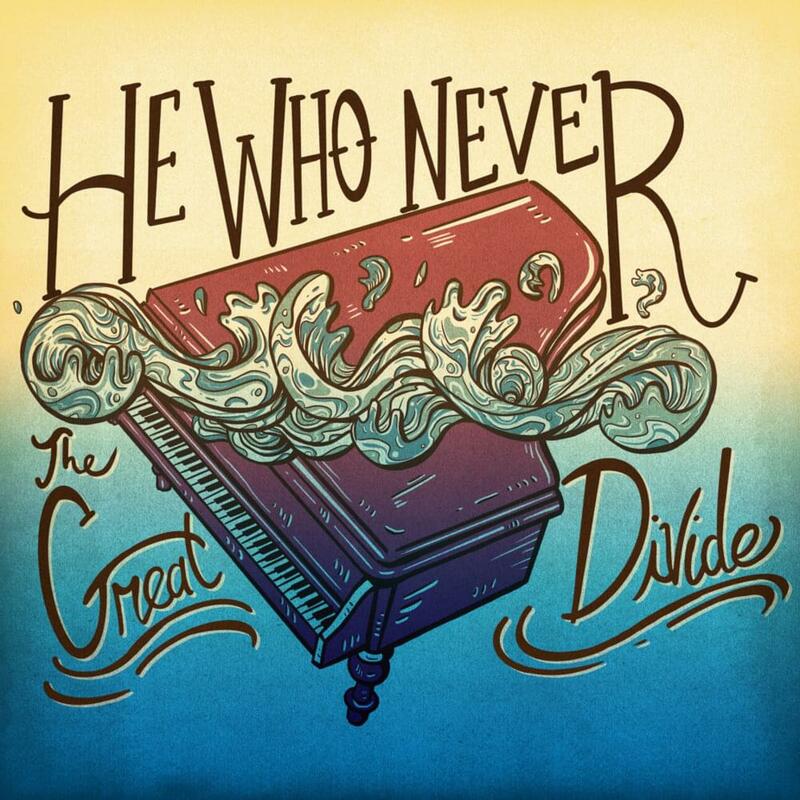 This is the kind of love and heartbreak He Who Never has explored in their newest single, “The Great Divide”. He Who Never is an alternative musical duo from Minneapolis made up of Aaron Rosell and August Ogren. They released their first EP in 2010 and since then, they have released yet another single and EP. “The Great Divide” is their first release since a complete rebranding of their group this year. On social media, they have said there’s more to come. The song begins with a chime-like sound, somewhere between wind chimes and electric piano. The notes are not super bright to the ear, but rather have a more hollow sound. They are rhythmic, and that movement makes the sound less whimsical and more modern. Upon first listen, the melody reminded me of an iPhone ringtone (and I mean that in the best way possible). As that melody progresses from its monotonous beginning, it almost begins to feel rooted in piano, as if that’s where the duo began when writing it. A synth beat begins, sounding like it was straight out of the 1980s. It’s echoey, as if it’s bouncing off the walls of the room you’re listening in. Right before the first verse begins, a strum of an electric guitar drones on in the background, giving you just a quick splash of rock and roll, only to return to the electronic vibe it had been building previously. Rosell’s vocals are low, not in the sense of melody but in volume. His voice is very controlled and smooth, but he maintains this soft sound, almost as if he is processing the heavy lyrics as he sings. The softness of his voice matches the laid back music of the song so far. A real drum beat kicks in for the second verse, including some angelic background harmonies. Even as the music gets louder thanks to this new set of percussion, Rosell’s vocals never raise in volume. He never belts, rippling with anger or passion. It’s an artistic choice I really respect. It’s as if the emotions he’s feeling from the lyrics cannot even be overcome by the heightened music he is surrounded me. That melancholy cannot be washed away. One thing I noticed was that there is no true chorus in this song, only five individual verses. No repetitive words or lines. We could possibly assumed the fourth verse acts a bridge, because the music cuts back to something minimal. That’s a phenomenon that occurs often with bridges in typical pop songs in order to bring focus and emphasis to the lyrics. But even the fifth and final verse has this minimal music. Perhaps the duo made a choice of which verses are “louder” than others based on lyrics or something else. The song title isn’t even mentioned in the lyrics until the last line, which is another interesting choice. In the midst of the very last line, the music drops off mid vocals. In that short moment before the end, you can truly hear the raw emotions and weakness of Rosell’s voice. shallow beneath the weight of what we don’t know. but the air is thin inside. The idea of leaving each other, leaving this relationship, is a result of rational reason. It’s what needs to happen. The two are barely breathing under the weight of the unknown. They can’t carry on if they don’t create oxygen (in this case, fix the problem, relieve the pain, etc). The air is thin inside, so you can assume it’s easier to breathe outside their “usual”, outside their comfort zone. Their comfort zone has been each other, so this time, it’s apart. I just wanted you to learn. He wants her to let it go, let the pain fade away with time. He uses this great metaphor, making introspection a torch. She is reflecting on her own emotions and thoughts and that ultimately teaches you things about yourself. In this metaphor, when you confront the negative emotions and memories you wish to be rid of, the torch gets hotter, it gets harder for her. In the end, he just wants her to grow. can while away with easy talks. It’s something that we had, and then we lost. we think we want, and where we go. No matter how hard they try, they can’t change the past. Their past isn’t something they can work through in easily. It takes time. Even though they’re apart, he doesn’t think their’s is a love they completely lost; they’re still living in each other’s hearts and minds. Their relationship is like a record on repeat, never ending, worn out. There’s always a difference between what they desire and what they actually achieve. They just never do this relationship right. breathe it in and out, in and out, and move along. And in the morning, I will turn around to take it in. Gotta let you go, gotta let you go on. This verse continues the theme of breathing. If he gives a little, puts in the effort to make her happy and resolve everything, she can finally breathe and move on. They can both begin a brand new day, just not together. I will pull them out and dust them off in time. and I loved you still, but I couldn’t make it right. He’s grateful for the happy memories they created and he plans on keeping them forever, so he can remember every once in a while. He wants her to remember that they took everything they knew about love and threw it in the deep end, into the unknown, in order to be with each other. His love is still there but he knows they can never make peace with their past.